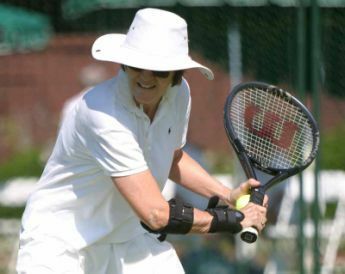 Phoenix area senior tennis players Anne Guerrant (Gilbert), Sherri Bronson (Scottsdale) and Sheila Johnson (Peoria) recently turned in strong performances at the USTA National Women's Grass Court 30, 40, 50, 60, 70, 80 & 90 National Championships at Forest Hills, N.Y., with Guerrant hauling in the women's 60 singles crown, and Bronson picking up fourth in both Women's 50 singles and doubles. The tournament, held at the	former site of the U.S. Open - West Side Tennis Club,	is one of the big four USTA adult national championship Grand Slam events. Guerrant, a former Top 15 WTA Tour professional, swept through the field as the No. 4 seed at the event, losing just one set in her five matches. She	topped three seeds along the way (1, 2, 5),	including a 4-6, 6-2, 6-1 victory over	top-seeded Brenda Carter (Charleston, S.C.) in the final. Bronson, who was coming off a fourth place finish at the Women's 50s Indoor event in June, put in a solid run at the Grass Courts, reaching the semifinals in both singles and doubles. Shelia Johnson (Peoria, Ariz.) also played in the Women's 50 singles and doubles events, reaching the round of 16 in singles and the quarterfinals in doubles.